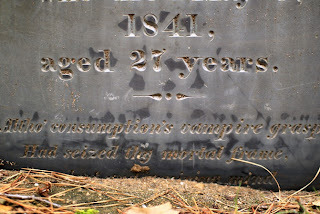 October 1, 2011 — I'm no Van Helsing, but I've seen my share of vampire graves. Mercy Brown's in Exeter, Rhode Island. Sarah Tillinghast’s, just a couple of miles away in the same town. The Ray family plot in Jewett City, Connecticut. The Spaulding graves in Dummerston, Vermont, for those that count them as such. The crypt of the Richmond Vampire in Virginia. Heck, even Bela Lugosi's grave in Culver City, California. 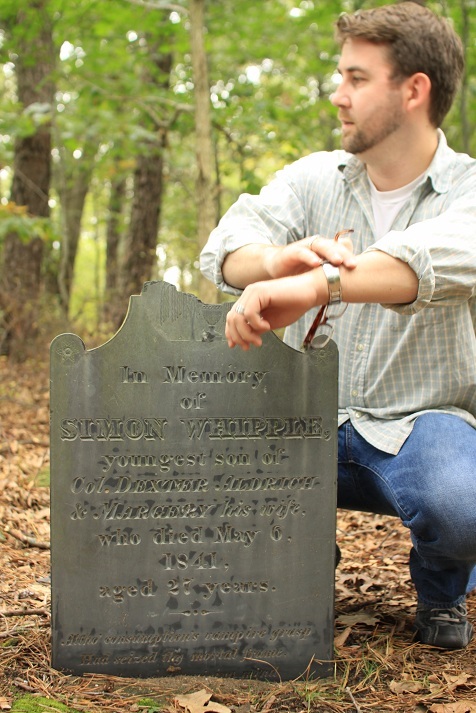 But never once have I seen a vampire grave so clearly, well, labeled as Simon Whipple's in North Smithfield, Rhode Island. On Smithfield Rd. 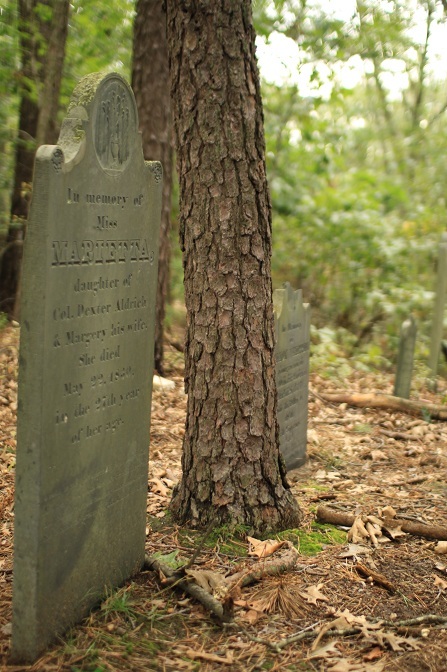 in that town is Union Cemetery, a large, open, well-maintained Rhode Island historical cemetery that is far, far from spooky. However, if you go to the southeast border (the side of the cemetery closest to Buell Ave.), you’ll find a forest. 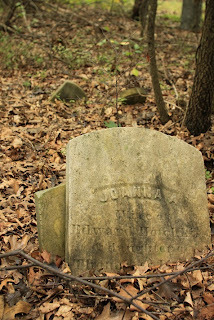 Just a few steps into that forest, you’ll come across the remains of a few smaller cemeteries that have been annexed into the purview of Union Cemetery. 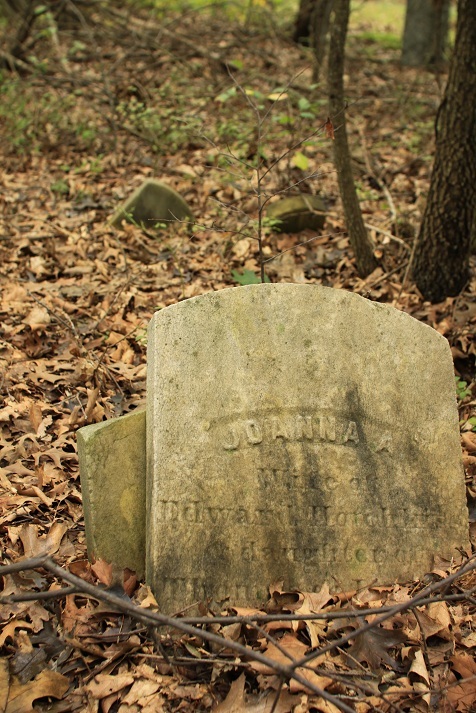 The forest has completely assimilated these old graveyards. A slight path wends its way through a few cleared plots, but most of the 200-year-old slate tombstones poke up from the leaf, twig, moss, and fungus floor of the forest, where they lean against the trunks of trees, have collapsed into shards, or just generally have been overtaken by nature like the bodies they once marked. Many of those graves bear the name Aldrich, since a portion of that death-land was a familial burying ground, and among all that Aldrich is a bit of eldritch. One of those stones marks the final decaying place of a man named Simon Whipple, a member of that Aldrich family. Nothing much is known about him and what is comes directly from the remarkably well-preserved information on his broken headstone. So if you’re one to believe in the inerrancy of epitaphs, Whipple was the youngest son of a Colonel Dexter Aldrich and his wife Margery, who are buried nearby, and he died at the age of 27 on May 6, 1841. Ostensibly. We could have a lot of fun finishing that stanza ourselves, and that’s pretty much all we can do since the above is Simon Whipple’s vampire story from start to finish. No wasting relatives, no hasty exhumations, no excised hearts, no burned corpses, no superstitiously arranged bones like in some of the other vampire tales of the region. At least that we know of. 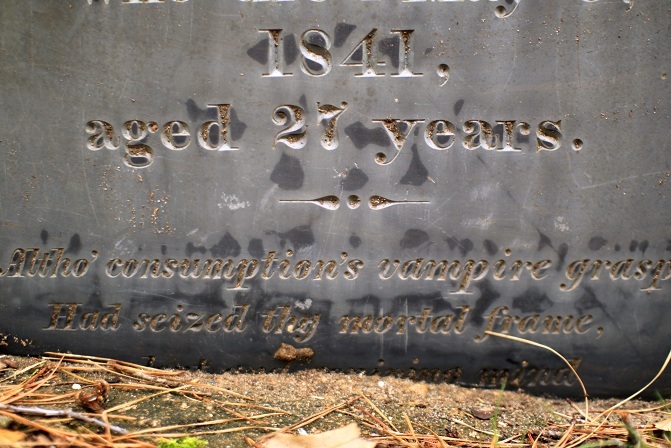 Just the fact that somebody for some reason waxed darkly poetic about the death of Simon Whipple in one of the most permanent ways one can, using the word vampire half a century before Bram Stoker popularized the term. 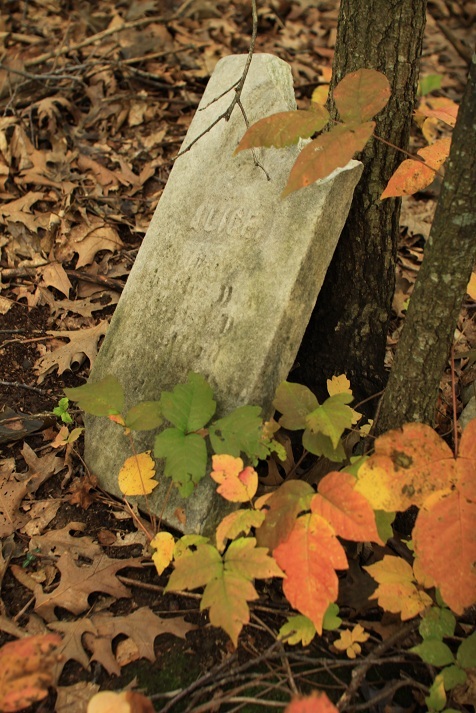 To find Whipple’s headstone, enter Union Cemetery proper and head to its aforementioned southeast border. 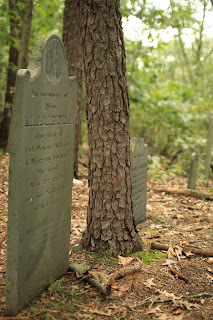 You can see some of the forest headstones right from the edge, with a few easy openings into the woods to access them. Whipple’s rot rock is close to the edge, so you don’t have to go deep into the forest, but it’s not really on a path. Just look for the rather unique Willow-engraved crown of its neighbor gravestone (unique for this cemetery, anyway), which belongs to Whipple’s sister, who apparently also died at age 27. The crown of Simon Whipple’s own grave has been broken…I assume by Whipple himself, while using it as leverage to extricate his immortal frame from the grave during one of his nightly resurrections. When you look for it, be sure to wear garlic and a cross, just in case, although the only bloodsuckers you’ll probably come across are mosquitos and ticks.